Sick babies admitted to a neonatal unit after a difficult birth could benefit from a new bedside tool to detect brain damage, researchers believe. The team at University College London has developed a device which shines light into the brain to monitor oxygen and energy levels. Broadband near-infrared spectroscopy (NIRS) could help doctors assess brain damage earlier and tailor treatment. A clinical trial of the technology is now planned. According to the National Neonatal Database, around three in 1,000 babies born in England suffer brain injury at or soon after birth, due to lack of oxygen during delivery. While many affected newborns recover, more than half develop disabilities, and one in 10 dies. 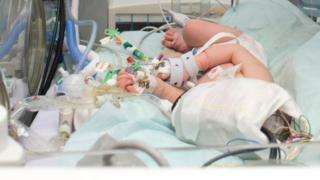 The risk is higher in babies born before 37 weeks, where up to 26 in 1,000 babies are affected. Early detection and treatment of brain injury could help doctors work out whether treatments are working and predict the severity of injury. Until now, doctors have often had to wait several days before newborn babies are stable enough to undergo an MRI scan to look for brain injury. Doctors already use light sensors to measure tissue oxygen levels, but the new equipment also measures energy levels in brain cells. Speaking at the British Science Festival in Hull, Dr Gemma Bale, an engineer from University College London working on the NIRS instrument, explained: "The device, which can be used straight after birth, is placed on the head and shines red and infra-red light into the brain. "This type of light can more easily penetrate the body, like when you shine a torch on your hand. "Changes in brain oxygen levels and energy usage change the colour of the light that is reflected back. "Our sensors measure the reflected light to work out whether brain cells are healthy or damaged," she said. Babies with reduced metabolism are those who are likely to do badly, as it means parts of their brain are too damaged to function. Dr Bale said this offered a more patient-focused approach. "The first week after birth is a really critical time in babies' development. If we are able to get in sooner to assess the damage, we can tailor treatment to save lives and help prevent disability further down the line." Dr Kathy Beardsall, a neonatologist from Addenbrooke's Hospital in Cambridge, said: "In these vulnerable babies, being able to use a bedside, non-invasive technology would be a great advance in care. "It overcomes the problem of having to wait and transfer babies off the intensive care unit for an MRI when they are more stable." The UCL team is planning a clinical trial to see whether the new technology could improve the care of newborn babies with suspected brain injury.